The SafeSquid Limits feature allows you to define User Limits, for accessing content from the Internet. You can create rules to limit the maximum size of individual files that are fetched from the Internet. These rules can also pre-set the speed-limits at which the content may be accessed. Rules that set limits to the nature of content being accessed during specific time-periods, can also be set. This option allows you to enable or disable a rule. Comma Separated list of LDAP Profiles to which this entry shall be applicable. 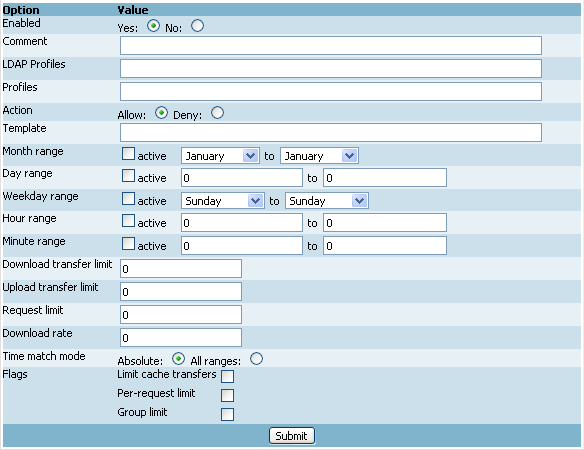 This entry will match if any of the LDAP Profiles specified here, match. A comma separated list of Profiles on which this rule should apply. The rule applies to every one if this field is left blank. The action to take when this entry matches. If set to Deny - any request falling into the specified time range is blocked, otherwise the request is allowed. Select Allow if you desire to set a limit on the amount of data that can be transferred, or the number of requests that can be made. Further access will later be denied, when the limit is reached. The range of months within which this entry is active, e.g. January to March will keep this profile active from January through March. Applies to all months if left blank. The range of days within which this entry is active, e.g. 5 to 15 will keep this profile active from 5th through 15th. Applies to all days if left blank. The range of weekdays within which this entry is active, e.g. Monday to Thursday will keep this profile active from Monday through Thursday. Applies to all weekdays if left blank. The range of hours within which this entry is active, e.g. 9 to 12 will keep this profile active from 9 hrs through 12 hrs. Applies to all hours if left blank. The range of minutes within which this entry is active. This can be used in conjunction with Hour Range, e.g. if the hour range is 9 to 12 and minute range is 15 to 30, then the profile will remain active from 9:15 through 12:30. Applies to every minute if left blank. The amount of download in bytes that would be allowed during the specified time. No limit if left blank. The amount of upload in bytes that would be allowed during the specified time. No limit if left blank. The number of requested that would be allowed during the specified time. No limit if left blank. The maximum download transfer rate (speed or QoS) that should be allowed. Maximum available if left blank. The time match mode option allows you to specify how a time is matched, if you specify multiple ranges. Absolute - If the Weekday range specified is Monday to Friday and Hour Range 9 to 17, then selecting 'Absolute' Time Match Mode, will match any time starting Monday, 9AM and ending Friday, 5PM. All ranges - If the Weekday range specified is Monday to Friday and Hour Range 9 to 17, then selecting 'All ranges' Time Match Mode, will match any time between 9AM to 5PM, on all weekdays from Monday to Friday.